We get lot of people asking how to hide some parts of the menu. There are so many options available for hiding pieces but I understand sometimes you just want that one thing hidden that is missing from options. Things like these (hiding elements from the menu or any other alteration to menu layout) can be easily done with CSS codes. Here is how. Click on an element you want to edit within the page in the menu. In the above example we want to edit the event times on calendar event row. Now look on the right side pane. This is the CSS class names that we can use to apply new styles to change styles ONLY to event time HTML element (in this case). In a similar way you can find the previously applied styles to one single HTML element of the calendar you want to change. Now go to foodpress> Styles page and paste this CSS class string you copied for the element you want to edit from the inspector. Solution #2: the class name for the element you are trying to change styles may not be strong enough to override existing styles. What you need to do is before the class name of the element include class names and ids of parents of the element. If that doesn’t override the styles you are trying to change, use !important after the style property. 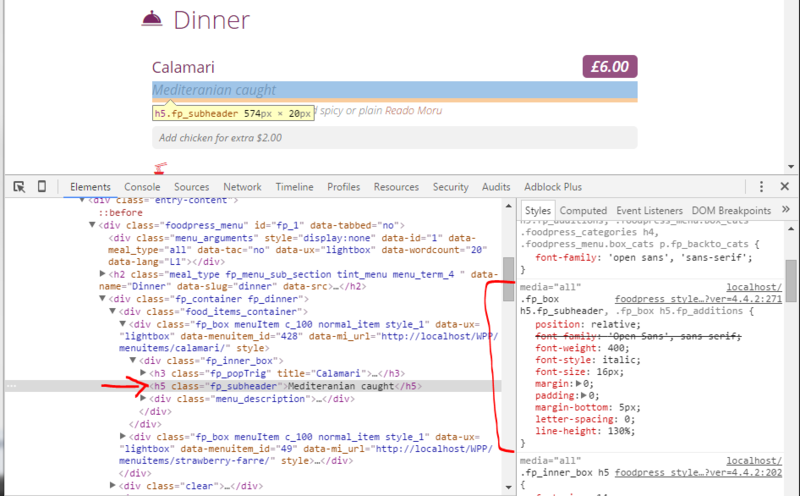 Once you get a hold of how to find the correct CSS class names for an individual element in the foodpress menu it is really easy to use this to alter the menu to the exact way you want it to be.